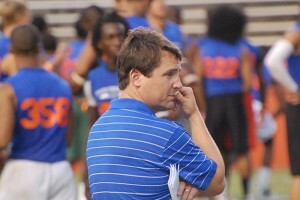 Welcome Coach Will Muschamp……now go out and win the SEC. LOL – and not far off from the unrealistic expectations of many Gator fans no matter the situation. Coach Muschamp has an excellent resume and experience in the SEC, which is vital. Understanding the weekly grind of the SEC season will benefit him in the long run. Charlie Weis comes aboard as the new Offensive Coordinator – a shocker to most following college football, and an exceptional coup for Muschamp. He knows that Weis will eventually develop an effective offense with time and recruiting his own guys. Frank Verducci comes from the NFL as Offensive Line Coach, and will have his hands full with an inexperienced, but talented bunch. Dan Quinn comes from the NFL as well to Gainesville as the new Defensive Coordinator. He has experience coaching with Muschamp at Miami, and should be able to implement the schemes that the Head Coach wants to utilize. Travaris Robinson is the new Secondary Coach, and comes to Florida with playing experience in the SEC and a lot of energy the kids are already enjoying. Former Gator Aubrey Hill returns as Wide Receiver coach and has earned praise from his guys during practice. Finally, former All-American and Pro Bowler Bryant Young helps out with the Defensive Line, a great role model for young players. Given the short amount of time Muschamp had to assemble his staff, you have to say he’s exceeded expectations and pulled some real surprises to re-energize the program. The biggest off-season job will be re-building the confidence of this group of players, starting with the QB. John Brantley played poorly in 2010 – injuries or not. The incredible addition by subtraction of losing the Dazzler as OC and replacing him with Weis can’t be overstated. It will be a pleasure to watch a real coordinator take the reins and actually game plan and adjust during the games as well. Brantley is the guy, no matter the reservations of Gator Nation. His confidence had to be shattered, and Weis will earn a lot of his salary if he can make JB4 a functional SEC QB. A real concern is the lack of experience behind him — redshirt freshman Tyler Murphy and true freshmen Jeff Driskell and Jacoby Brisset are the candidates. Murphy seems to be the #2 guy heading into the opener, but if JB4 struggles, it’s a crapshoot as to who emerges to build for 2012. There is still a lot of talent and speed at RB, starting with the return of seniors Jeff Demps and Chris Rainey. Either Mike Gillislee or Mack Brown have to become the pounder between the tackles, while Trey Burton will get a lot of snaps as an H-back-type player. He’s the most versatile of the bunch, and I believe Weis will spotlight him this season. There is plenty of talent at WR, but talk about underachieving. Coach Hill has his work cut out for him to get this group to play at a SEC level. Deonte Thompson has one last chance to fulfill his promise. Frankie Hammond, Jr. and Quinton Dunbar could be the top 2 guys this fall and have a lot of promise. Weis has to figure out a way to use Omarius Hines more (probably some FB and TE plays as well as at WR), and Andre Debose can be a huge threat with some coaching. Tight end is a mess going into the fall. Jordan Reed is a fine runner and can catch, but is too small to be an effective in-line blocker. Freshman A.C. Leonard was pushing for immediate playing time, but will miss the first month due to injury which will set him back. Gerald Christian is the only other viable option, and played sparingly last year. Definitely the weakest offensive group. Weis must compensate with his formations and play-calling to work around this shortcoming. Finally, the OL, while inexperienced, could be the dark horse unit that elevates the Gator offense to a competitive level. If the health of Matt Patchan holds up, the OT rotation of Chaz Green, Xavier Nixon, and Patchan could be one of the league’s best. Jon Halapio, Ian Silberman, and James Wilson are a solid group at OG. I’m encouraged at the progress of Jonotthan Harrison at C, and Nick Alajajian and Dan Wenger provide depth at both C and OG. Coach Verducci has the material to field a solid unit with some effective coaching. This is where Will Muschamp can make an immediate and direct impact, and having Dan Quinn as Coordinator should reap benefits. The Defensive Line is the strength of the entire team, and must take the lead all season for any real success. Great depth and talent inside with Jaye Howard, Omar Hunter, and Sharrif Floyd ready to wreak havoc……possibly a top 10 unit nationally. Leon Orr and Dominique Easley can contribute some snaps as well without a lot of dropoff. Defensive End has some talent, but it has not shown on the field yet. Ron Powell is a potential all-SEC player at the Buck position, but after that it’s a mystery. It’s now or never for William Green, with a bunch of unknowns in Kedric Johnson, Earl Okine, and freshmen Lynden Trail and Tevin Westbrook. Physically a solid group, but it has to translate to production on the field. Perhaps some of the DTs slide outside in 3-4 alignments. At Linebacker, it’s top-heavy with Jon Bostic and Jelani Jenkins, followed by an inexperienced group. Lerentee McCray has to take the lead at starting OLB. Some depth has to develop quickly between Michael Taylor, Graham Stewart, Darrin Kitchens, and the enigmatic Dee Finley. Any injuries here could prove disastrous. Poor recruiting by DJ Durkin and the former staff has to be addressed immediately starting with the 2012 class. The Cornerback position has the most frightening depth chart on the roster. Jeremy Brown can be a solid SEC CB if healthy, but opposite him it’s anyone’s guess as to who steps up to the challenge. Cody Riggs is undersized but tough, Moses Jenkins is fine as a Special teams player, but simply isn’t SEC-level, and Jaylon Watkins is unproven. Freshmen Pop Saunders and Louchiez Purifoy have a great chance for early playing time, but will struggle while learning. A scary unit to watch this fall……the front seven has to carry a lot of weight to offset deficiencies here. At Safety, there is some quality depth returning. Matt Elam and Josh Evans saw plenty of action in 2010 and are the starters. Freshmen Josh Shaw, Chris Johnson and Valdez Showers will get plenty of opportunity, and have shown well so far in practice. Again, not the depth chart you want in an SEC contender, but better than the CB position. Caleb Sturgis received a medical redshirt and returns as the PK. He’s solid, but has a lot to prove this fall. The huge of loss of punter Chas Henry will hopefully be filled somewhat with freshman Kyle Christy, but a freshman punter is always a risky thing……probably some growing pains this fall that hopefully don’t lead directly to a loss. He has a lot of promise, but simply needs time and experience (which unfortunately he’ll get from game one). 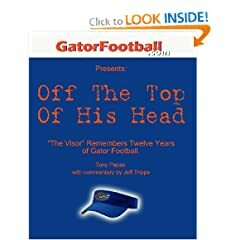 The lack of scholarship players (Florida enters 2011 with 70 out of a possible 85) means starters and second-teamers have to step in. This isn’t necessarily a bad thing, but some unexpected injuries really could have a domino effect on the starting units. The Gators can beat any opponent on this year’s schedule. However, the consistent quality of opponents I believe will catch up to Florida down the line. The Gators face Tennessee in September, followed by an October stretch of Alabama, LSU, Auburn, and Georgia (after an off-week). Plus a trip to Columbia to end the SEC regular season. I think the Gators find a way to split the 4 October games, and it’s difficult to say which ones will be wins and losses. After that, the grind will wear down a thin depth chart, resulting in a loss at South Carolina. There are still too many unanswered questions with the inexperienced O-Line and lack of depth at DE, LB, and especially in the secondary to allow me to predict 2 losses or less. An almost complete turnover in the coaching staff with new schemes (a huge change on offense) will challenge even an experienced roster. If this team can get to 9 wins in a transition year, that will be a significant accomplishment. This is an optimistic prediction, as 7-8 wins is entirely possible.